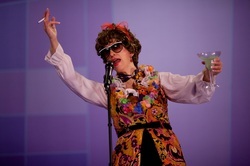 (left: Kirsten Van Ritzen playing her character Louise for some laughs (photo by David Bukach). Whether it’s to cheer us up, connect with friends, avoid an awkward silence, or to keep us from keying our neighbour’s car, comedy seems to do the trick. Laughter cuts tension, lightens the mood, and allows us to explore every kind of topic from airplane peanuts to racial profiling all in a way that transcends the straight-faced nature of everyday public life. On that note, the very first Funny Women Festival will be exploring a variety of themes with acts that include standup, sketch, improv, as well as music and it’s all delivered from an entirely female perspective. the flashy tie-dye shirts she sports on stage, things were not always so bright for Rose. form of therapy: “TV and chips,” she says with a full stop. performer, but it wasn’t until after studying sciences at the University of Victoria and working for the government that she decided to try her hand at show business. While working in the field of tree-ring dating, Brelsford asked herself, “Do I want to do this for the next 40 years?” It wasn’t long before she went to New York to attend the American Academy of Dramatic Arts. everything: “There’s a huge range of voice, diversity, and variety,” she says. Festival will not be the last.